It’s summertime in Wyoming and the living is good! We hope you have been enjoying the great outdoors this summer in one way or another. If you still haven't, what are you waiting for!? Not only does Wyoming offer amazing views and plenty of great camping spots, if you want to spend a little extra change, you can get a truly one of a kind experience. Here are a couple of ideas for people who want to experience high-end camping while having a great time. Yellowstone National Park is one of the most prestigious parks in all the land. Some people though are hesitant to camp at the park because it is so big and there are so many things to do! What if you went to Yellowstone Lake and when you walked up there was a pitched tent loaded with everything you need (including beds), as well as guides who took care of everything from meals to hiking and kayaking excursions? Well that can happen with Outfitter Far and Away Adventures! Participants can experience a two-night luxury camping experience that costs $840 for adults and $760 for children and features many exciting things to do. For first time road trippers to Yellowstone, this is a great way to dive into a backcountry camping experience without the headaches that come with trying to find a safe and efficient way to camp. 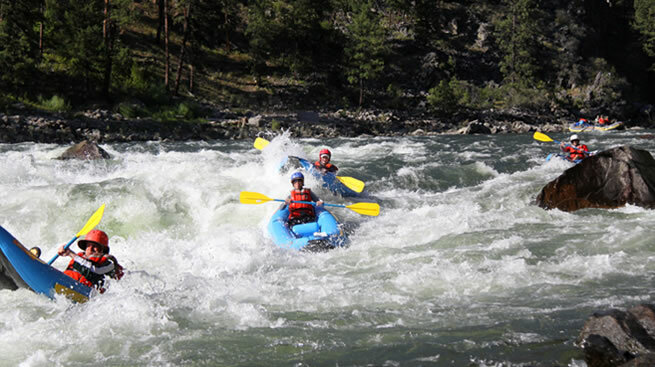 Activities available at the lake include kayaking, paddling, fly fishing, or choose your own adventure to discover the wonder that is Yellowstone. If you want to take in the beauty of Wyoming but also sit back and relax in style, you should head to the The Lodge & Spa at Brush Creek Ranch. This luxurious ranch is set on 15,000 acres of Wyoming’s North Platte River Valley. For just $600 a night for up to four people, you can get a full cowboy experience that starts with a pack-trip on horseback! Guests are then led by a wrangler and an activities director, who will take you to your 700-foot circular tent. Once settled in, they will then prepare meals over a campfire, and arrange activities from hiking to fishing. At night participants can stargaze, eat some food or listen to some great music. This vacation is a great way to experience an old school Wyoming life while also spending quality time with family or friends. Your group will be sure to love everything the Brush Creek Ranch has to offer! If these activities have you itching to get out and camp, let Sonny's RVs help you! We offer several new and used RVs for our customers to choose from, but that's not all we do at Sonny's! Need your RV serviced? What about parts? We do it all at Sonny's. Stop by our location today at 5000 E. Yellowstone Highway or give us a call at 307-237-5000.